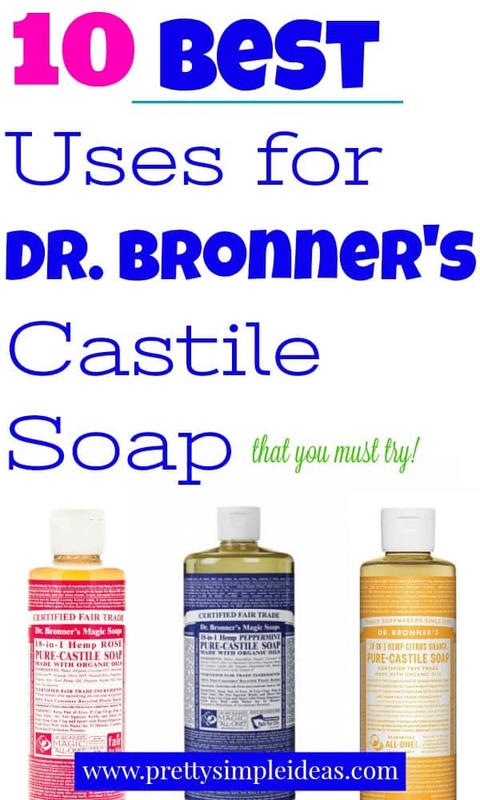 According to the Dr. Bronner’s company, there are 18 uses for Dr. Bronner’s Castile soap, but to keep things simple I’ll give you my top 10 favorite. This castile soap – meaning it’s made from 100% plant oils – is also organic, free from any harmful ingredients and preservatives, fair trade and comes in eight main varieties including Peppermint, Tea Tree, Lavender, Eucalyptus, Citrus, Almond, Rose, and Unscented Baby Mild. Besides being a “healthy” soap, it can be used for personal hygiene as well as for your kitchen, bathroom or laundry. And not that you’re easily swayed by celebrity endorsements, but Lady Gaga reportedly loves Dr. Bronner’s, joining Sandra Bullock, Drew Barrymore, and Kristin Bell. Dr. Bronner’s castile soaps are concentrated so if I had to offer one bit of advice before you begin – dilute dilute dilute. The good news is the bottles seem to last forever! As promised, below are my top 10 favorite uses (in no particular order) of this truly versatile soap. I have problem skin so first of all I was happy to find Tea Tree soap, and second that it was free of anything harmful that could further irritate my skin. I was really blown away when it worked. The rose is a second favorite of mine because it’s also great for problem-skin and smells pretty. Extra Tip: Moisturize after! Dr. Bronner’s leaves your skin feeling a little…tighter than regular face soap. It creates the best bubbles and leaves a wonderfully strong scent. I use this soap to clean anything from my toilet to bathtub to countertops to even carpets! It works great plus like I mentioned above, leaves a great scent. If I had to pick a flavor to clean with it would be Citrus. Again, a little bit goes a long way. Now this may seem strange because after all, it is soap. I probably wouldn’t have tried it myself but I recently started medication where I am not allowed to have anything peppermint, including toothpaste. So I decided to give Dr. Bronner’s a try. Turns out…it tastes like brushing your teeth with soap. The Tea Tree was disgusting to brush my teeth with but the citrus wasn’t bad at all. According to my sister, her and her husband only use Bronner’s for their toothpaste. However, I’d recommend Peppermint and to use just one or two drops. You don’t need an expensive makeup brush cleaner – or one of those DIY ones that leave your brushes greasy. Just a few drops of Dr. Bronner’s…work through the bristles, rinse, and you’re good to go! It not only cleans all the gunk out, but is made with moisturizes to keep your bristles soft. You can use any variety you want, I just prefer the Tea Tree because it does a great job at getting all the gunk, AKA hair product, out. I use this once a week and then follow up with a deep conditioner. You first option is to take a bath (make it as hot as you can stand) pour a little oil under the running water and relax. For an even more concentrated therapy fill a large bowl with hot water (but not boiling) and add a squirt of either of these soaps. Lean over the bowl and place a large towel over your head. Breathe in deeply! Dr. Bronner’s is great to use for laundry because you won’t have to worry about chemical components being transferred to your clothes! I like using lavender best because it smells amazing. I also love using soap nuts because I can just throw them in without any pouring. It’s always best to buy organic food when you can, but not always possible. But even if you do buy organic you’ll still need to wash your fruits and veggies because of dirt and bugs. All you need is one drop in a bowl of water, a good dip (and scrub if it’s not organic) rinse and then enjoy! Wellness Mama also makes a fruit & veggie wash using vinegar if that is more your style. I suppose if you can use Dr. Bronner’s on your fruit and vegetables then it should come as no surprise that you can wash your dishes with it. Just squirt a little on your scrub brush and wash away. Dr. Bronner’s is sold online at the site, Amazon and grocery stores that carry specialty items like Whole Foods & Wegman’s. These are all Great tips, I love Dr Bronners for when we co camping, safe for the enviroment and smells AWESOME. I need to try these products! I’m always on the hunt for good quality body and cleaning products! That face wash sound so nice. Can’t go wrong with Dr. Bronner’s. I know it’s at the top of every major DIY beauty gal’s product list. Dr. Bronners is my favorite! I made a shampoo out of the original unscented and add some essential oils to it. I love it! It’s so fun to use in different ways, isn’t it?? Wow I honestly didn’t know you could use these for so many uses. Really toothpaste. Interesting. I use the peppermint one to wash my makeup brushes and it works a treat. It just smells so clean and fresh! I think I’ll just stick to toothpaste for my teeth, for now thanks…Have to ever read the writing on the bottle? Apparently, Dr. Bronner went a little crazy (I think he was in a concentration camp in WW2) and his family put all the weird things he said on the bottle. Strange but true! Ooh great tip, Caroline! I usually use Beauty Blender BUT I also have a mini bottle of Bronner’s Peppermint which I now know what I am going to do with next. 🙂 And yah the bottle is crazy – I had no idea he was in a concentration camp! Super interesting. I use Dr Bronners, but I mainly use it for hand soap and cleaning. My favorite is the almond scent. I am going to give these other things a try. The Almond is amazing. I love it for my face washes. I don’t know if I could do the toothpaste!!! Haha to be honest..I haven’t tried it yet. BUT. I have a bottle of peppermint which seems like a good one to try it out with! This is great! I recently bought my first bottle of magic soap and will be referring back to this list for tips on how to use it. Woohoo! You won’t look back now. This is super handy! I’m just getting in to using this soap and all of the magical ways that exist to use it! Katie – you’re going to have so much fun with it! I love Dr. Bonner’s peppermint soap, but have never thought to try brushing my teeth with it! I prefer using soaps and body products that are made with natural ingredients. I love Dr. Bronner’s, and there are so many uses that I haven’t even touched! Will definitely need to try these, thanks! I absolutely love Dr. Bonners. Use it everyday for multiple things. I love Dr. Bronner’s! I learned some new uses in this post so thank you! I’ll be using it as bubble bath tonight and will definitely have to try it as toothpaste! Yay! The toothpaste honestly is a little gross but your teeth do feel very clean after! SO glad I found this! We have a big bottle and I had no idea what to use it for! Now you have 10 awesome ways!! I hope you enjoy them. I have actually never used Castille Soap but hear about it ALL the time! My sister uses it for everything! Thanks for sharing I will definitely need to get some of this! Brit – woohoo! i hope you come to love it as much as me and your sister! So many great uses ! I could use this for so many things around the house. This is so helpful – picking up a bottle next time I’m at the store! I hear that Dr Brommer’s was multi-purpose but I wondered about the toothpaste ? Yah I’m not sure I’d switch to it full-time for toothpaste, but in a pinch it works! Wow! Never heard of Dr. Bronner’s before. This is a great post. I love it when you can use something for completely different reasons! I’ve seen Dr. Bonner’s soaps but haven’t tried any of them. They sound pretty amazing. Maybe I should pick up a bottle or two. Kimberly – you absolutely should. You will love them! Great ideas’ I use tea tree oil for my yoga mat! These are fabulous ideas! I see this in the store all of the time, now I’m going to have to grab a bottle! I’m going to pin this and share with my wife. Thanks for sharing these! We are all about alternative products so I am glad you wrote a post about this! Jeremy – that is awesome. Thank you! Great Article! I already use this soap, but now I know the other 10,000 ways to use it. 🙂 Thanks a Bunch. I love Castille soap! Dr. Bonner is one of my favorites; I add my own essential oil blends and my hands have never looked better. Thanks for sharing this amazing product so others can get its benefits. Andrea – so excited others love it as much as I do! I’ve never seen this soap before, I love the idea of it being totally natural! I mean, you can even brush your teeth with it! So funny, I just bought a bottle of this for keeping my new tattoo cleaned! My artist suggested using it. I had no idea about the other uses, si this is fantastic! How much lavender soap do you use in the laundry? I’m excited to give that a try. I have tried some of the other products like the bubble bath but not the soap. Love the products and will have to go and check all the others out. The bubble bath is awesome, too! I have never heard of Dr. Bronner’s castile soaps, but I will definitely have to look into getting some myself. These soaps sound awesome and I love that they are multi-purpose. Yup and good for your skin, too! I’ve never tried this soap before but.now I want to! Thanks for the ideas. Oh I love Dr. Bronner’s! I didn’t realise there are so many uses for it – especially tooth brushing. Will pin this for later.